The warning came from just over my shoulder from my tour guide, Eduardo. Treading water, all the participants in our group of 10 quickly glanced around the sleek surface hoping not to see any serpentine figures headed our way. With a fast perusal of the general area, we breathed a minor sigh of relief. We were already neck-deep and weren’t looking for any surprises. At least not of the animal variety. We were mid-way through our first experience in a cenote when the warning came. 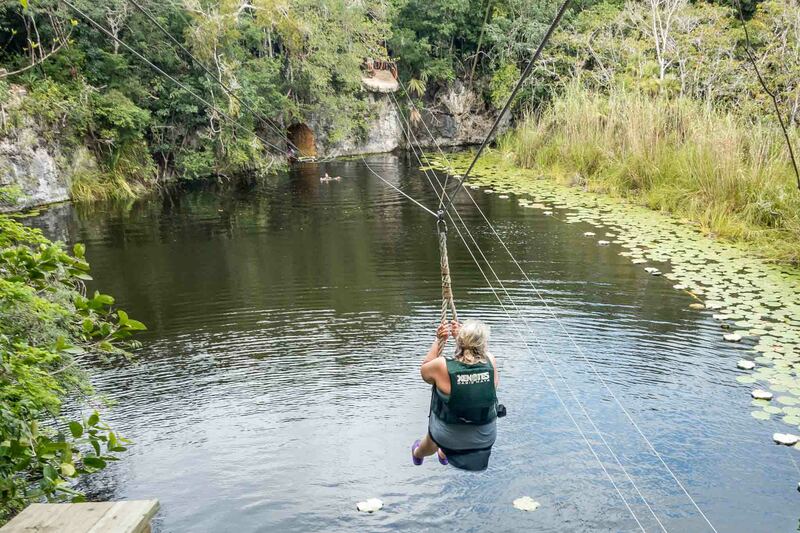 Having already jumped from a short zip line to the cool water below, we were up for almost anything. 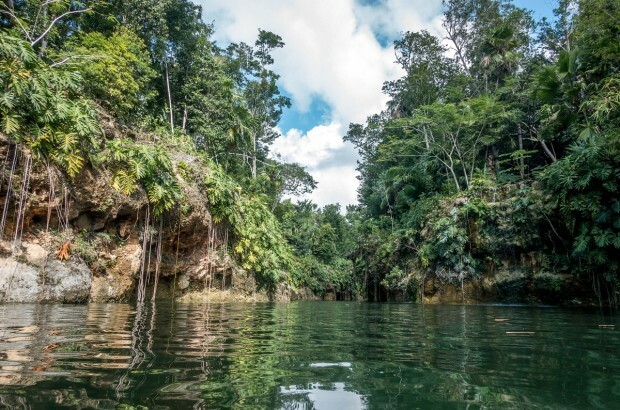 Tiny catfish circled our toes as we made our way to the next stop at the opposite side of the large sinkhole–an eight-foot-high ledge from which we willingly hurled ourselves, diving and flipping on the way down. Purchase your discount Xenotes tickets here . This first brilliant stop was only one of four during our day visiting the cenotes near Cancun. Exploring cenotes–whether swimming, diving, or snorkeling–is one of the more popular activities in the Riviera Maya area of Mexico. These giant natural pits are created over time when limestone bedrock collapses to expose the groundwater below. 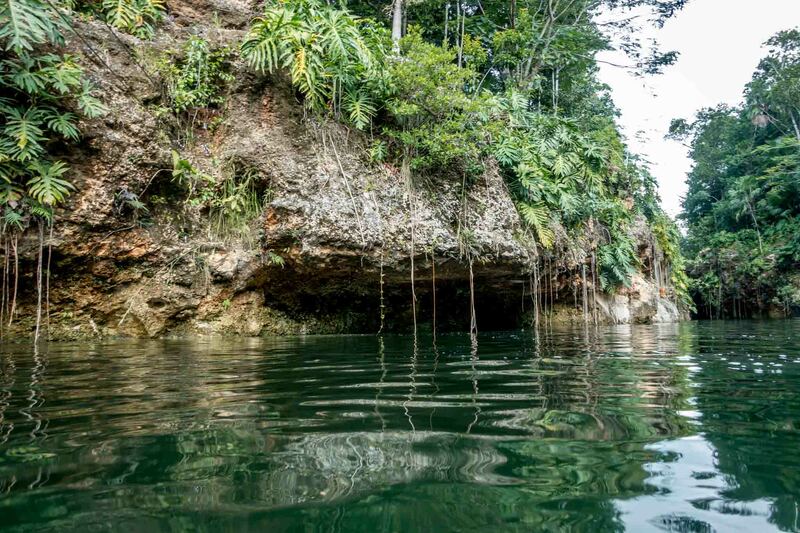 There are three types of cenotes–open, semi-open, and cave–all of which we visited on our tour with Xenotes Oasis Maya . Unlike many of the other offerings from Experiencias Xcaret (Xcaret, Xel-Ha, Xenses, and Xplor), the Xenotes Oasis Maya experience is not a park. 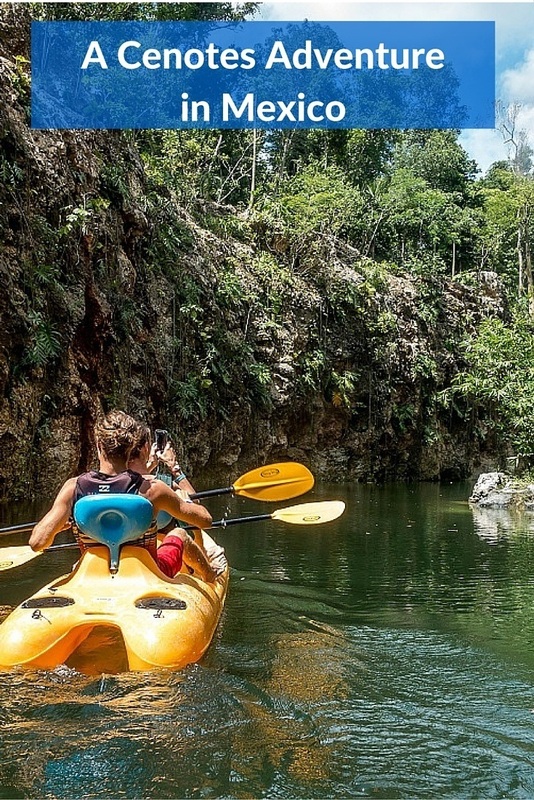 Instead, it is a tour that includes stops at four different cenotes along the Ruta de los Cenotes, a road that stretches inland from Puerto Morelos and connects many cenotes. A couple of stops on the cenote tour are practically within walking distance of each other, and a couple require a brief drive down a rather bumpy road that offers a “Mayan massage.” Each stop comes with restrooms and a snack or drinks, so you stay super comfortable while exploring the natural environment of Mexico. Across the four stops, there are four main activities. 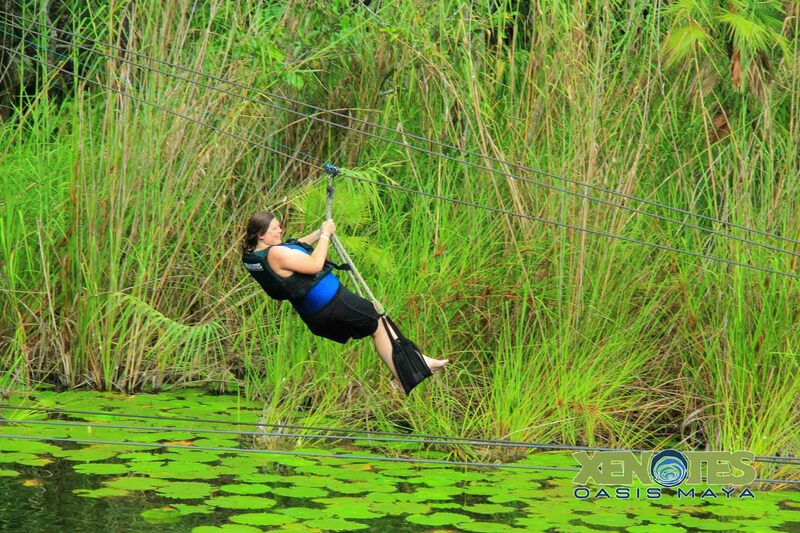 Both of the open cenotes offer the opportunity for zip lining. And lots of it! There are two options, both of which land you squarely in the refreshing water below. The first is a traditional bar on cables strung across the cenote. You hang on as you quickly zip across the lines just before dropping off into the water. The second is a swing that lets you glide easily toward the surface. Both are a lot of fun, and our group discovered new ways to hang, flip, and sail our way down. 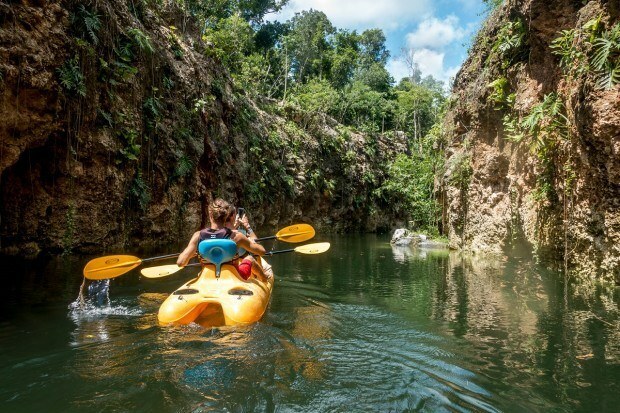 Groups head out in a two-man kayak for a short but beautiful ride through a cenote with sheer walls drenched with lush vegetation. As a relatively novice kayaker (only one somewhat painful experience under my belt), this was a perfect spot to refresh my skills without currents or other challenges. Swimming at each of the cenotes gives you a nice break from the heat of the Mexican sun. 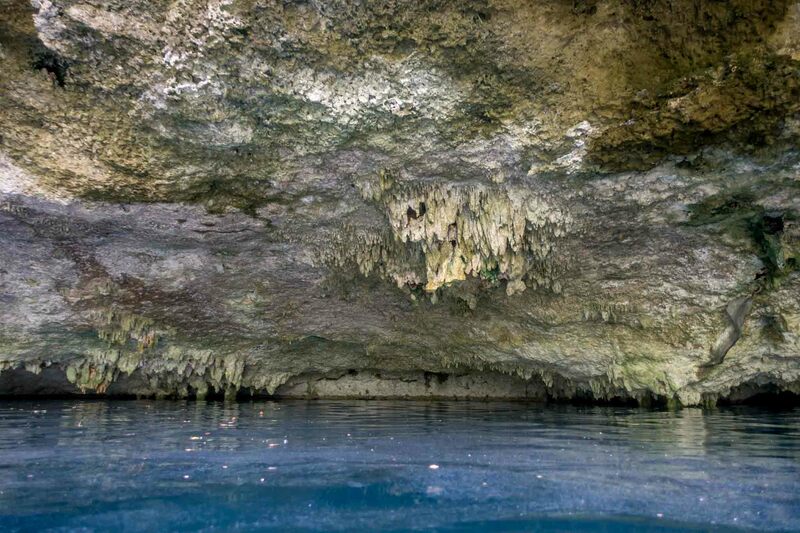 There is even an opportunity to snorkel in the semi-open cenote. Because the cenotes are full of freshwater, you won’t see the type of fish you might expect in the ocean. Instead, there are only small catfish and turtles along with some lily pads and rock formations. If that’s not impressive enough, take off your mask and float along while gazing at the unique, above-water scenery. How do you get through the small hole in the roof of a cave cenote? Rappelling, of course. 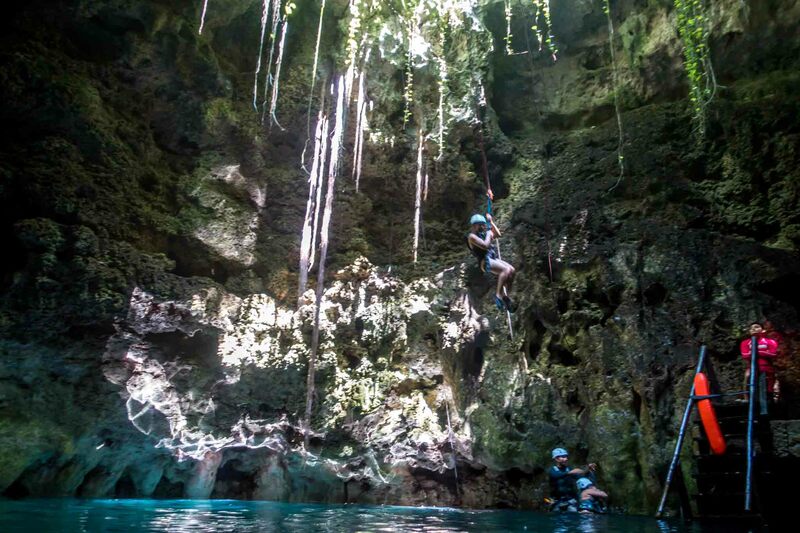 If you’ve never tried rappelling before, which I hadn’t, the Xenotes Oasis Maya tour offers a controlled opportunity to try this intimidating-looking activity. The employees have control of the ropes and harnesses the whole time, so you descend safely and easily into the (pretty darn cold) water below. You can even go upside-down, if you want to. There are two main options for visiting cenotes near Cancun. One is to rent a car and explore the Ruta de los Cenotes on your own (GPS doesn’t work in this area). The other is to go with a tour like Xenotes Oasis Maya. Normally, we would probably opt for doing it on our own. But sometimes there is something so great about not needing to arrange a rental car or worry about where you’re going, what you’re going to do when you get there, or where you’re going to eat. With this tour, everything is provided and the experience is easy, fun, and adventurous. A regular-priced Xenotes Oasis Maya ticket costs $119 for adults (age 12 and older) and $59.50 for children (age 6 to 11). You can save by booking your ticket online and by booking tickets at other Experiencias Xcaret attractions . We were the guests of Xenotes Oasis Maya. All opinions of the adventurous and wet are our own. Note: Some links may be affiliate links, which means Travel Addicts may earn a few pennies at no additional cost to you. 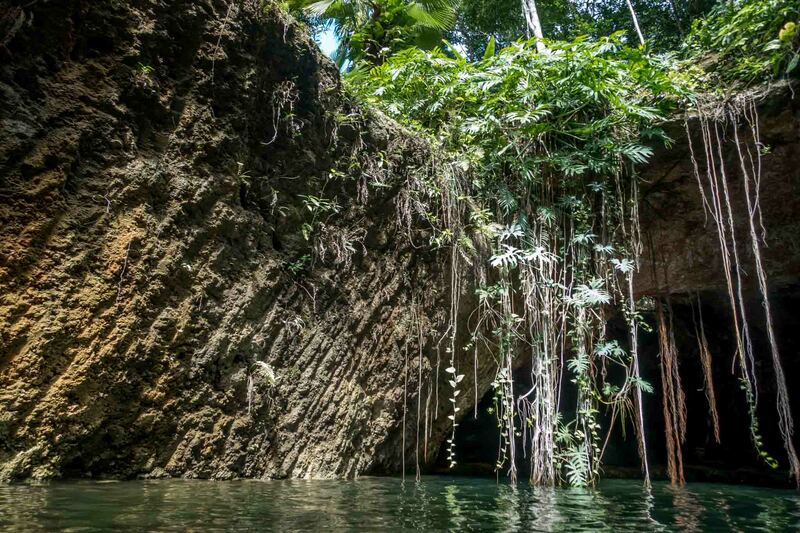 What do you think about Underground Oases — An Adventurous Tour of Cenotes in Mexico? I SO wanna do this! You’ve just added another site to my “must-do” travel list. Thanks for the inspiration. It was the top thing I wanted to do in Mexico (other than eat all the tacos, of course) and did not disappoint! I hope you get there soon! How fun! 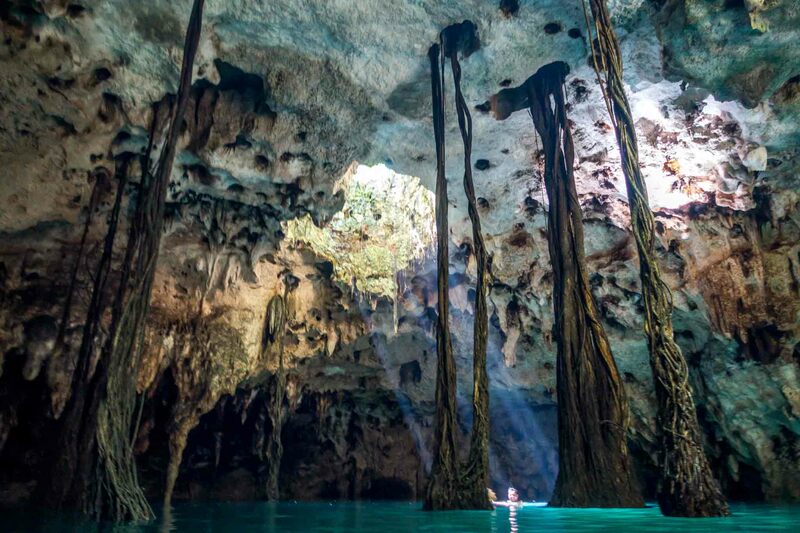 I’ve been to Cancun once before, but never made it to the cenotes. If I return one day, I’ll definitely be sure to check them out.